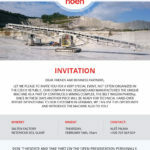 NOEN Holding | NOEN, a.s.
We present a group of companies that offer complete services from feasibility studies, technology designs, designing, engineering, realization up to commissioning, i.e., of both the technological and the civil engineering part of open-pit mines, power plants, heating plants, mining machines for open-pit mining, technological units, up to power transmission of constructions of electrical switching stations and high-voltage and low-voltage lines, including individual control subsystems. The NOEN Group arose from strategic investments in the firms with a high share of own know-how and a big growth potential. Thus, the unique merger of companies arose that can provide you with comprehensive services in the field of power engineering and open-pit mines. Acquisitions of individual companies were realized after careful consideration of their positions on the market, evaluation of know-how and contribution for the entire „HOLDING“. The NOEN Group has at its disposal more than 500 experienced employees who can offer you high degree of professionalism in all the mentioned fields.